A German elderly couple , today 80 + 50 years old who have been Dubai Tourists since a decade, bought in 2005 an apartment at Nakheel´s Dubai Residential Falcon Tower located on Plot H3 Jumeirah Lake Towers. The completion of this Tower should be March 2008 but the apartment was never delivered and they end up in a Horror scenario when the development was transferred from Nakheel to Al Fajer Properties in 2006. 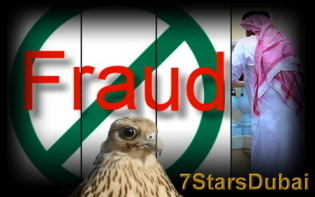 After have been mislead, deprived of their property rights by illegal actions and extortion ,financial and mental extremely damaged by receiving several threats from Al Fajer Properties since 2008 upon 2009, a criminal complaint was filed in Germany already in August 2009 against the CEO and President of Al Fajer Properties, Maktoum Hasher Maktoum Juma Al Maktoum. The witness hearings and investigations in Germany are still going on. In 2006 the Residential development Falcon Tower Jumeirah Lake Towers was transferred from Nakheel to DMCC ( 100% Government) and Al Fajer Properties was named by DMCC as new Developer of the Falcon Tower. DMCC ensured in writing that the terms of Al Fajer´s purchase was that Al Fajer Properties will developing the Falcon Tower with the same design, same unit specifications and price at which the couple purchased original at Nakheel. It was agreed between Al Fajer Properties to take 1:1 over the once valid contractual obligation – just the completion date will be now in December 2008. DMCC transferred the 45 % already paid installments paid once by the couple to Nakheel, in 2007 to the account of Al Fajer Properties. A Financial Statement, hold by the couple, from DMCC and Al Fajer Properties shows this evidently. The process was accompanied by a lawyer of the couple, the correspondence show evidence that Al Fajer agreed to the named conditions and stept 1:1 in the former contractual obligations. Left in the illusion everything went fine, Al Fajer Properties start in 2008 to threat the couple to sign and agree to a new contract.This contract was given to the couple in November 2007 in form of a draft in presence of their lawyer and staff members of Al Fajer Properties. It was a blank document , containing only terms and conditions but not containing any Building constitution, no Apartment specification, no price, and no other relevant declarations. It was a draft with no specification. Within this draft Al Fajer themself was not named as developer, just as seller. The Tower on Plot H3 was quoted in the Header now as Mixed Use Building ( Residential/Commercial) and renamed to Jumeirah Business Centre 8. Several correspondence upon January 2008 sent to Al Fajer Properties to complete the relevant documentation failed. Al Fajer Properties didn`t provide the relevant Documentation. March 2008 Al Fajer Properties appointed a new CEO and President, Maktoum Hasher Maktoum Juma Al Maktoum. Starting on March 10, 2008 the couple received threats from Al Fajer´s lawyer Michael Kerr, Denton Wilde Sapte, to deprive them of the property and simply return the amount,unless they did not sign and agree to the incomplete blank draft contract. After receiving this threats from Al Fajer Properties, the lawyer of the couple ask Al Fajer to refrain from such illegal actions. The actions of Al Fajer have been mentioned to RERA Dubai. Al Fajer Properties didn`t retrain and repeated in letters upon 31 March 2008 the same threats to the couple. After this date it remain silent and Al Fajer didn`t react. A letter wrote by the couple to Al Fajer Properties in June 2008, brought a reaction of Michael Kerr Denton Wilde Sapte, a lawyer namely instructed to do so by the CEO Maktoum Hasher Maktoum, and showed willingness to pay a full compensation based on the damage cause by Al Fajer Properties to the couple. The discussion was about the sum and damage caused by Al Fajer, based upon the event to enable the couple to buy an adequate apartment. The market price of such an apartment was at that time over 2 Million AED. After several delays of Al Fajer´s lawyer to step in a negotiation, a concrete willingness from Maktoum Hasher Maktoum Juma Al Maktoum to provide a fair compensation was shown in September 2008. The correspondence was hold in written form via Email between the lawyers. A clear calculation about the caused damage and the therefrom resulted compensation sum was presented by the couples lawyer. But Maktoum Hasher Maktoum rejected this and set out a fixed sum, which would have caused the couple still a damage of 600.000 AED. Finally the so called good will of Maktoum Hasher Maktoum Juma Al Maktoum end up in further threats by Al Fajer Properties upon a statement October 2008 from his lawyer Michael Kerr Denton Wilde Sapte , by not taking the now offered amount, to return only the amount of the once paid 45%. ( 345.000 AED). Within this letter have also been threatened that they contacted in April 2008 a Journalist providing him what happened to them, they would get in trouble if they made the story public in the future. 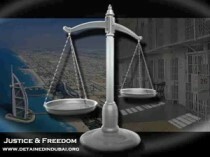 No more correspondence sent to Al Fajer Properties or their lawyer were answered after January 2009. Later it was revealed by the couple , over a document provided to a foreign court, that Al Fajer Properties CEO Maktoum Hasher Maktoum Juma Al Maktoum sold on March 31, 2008 the Tower Plot H3 Jumeirah Lake Towers as a 100% Commercial Tower to Dynasty Zarooni . The Price per sqft within this MOU, agreed between this parties, was 2050 AED. This however was nearly the triple of the price Al Fajer had to deliver the 1098 sqft apartment of the couple, purchase it for total 775 000 AED and on which was Al Fajer in the contractual obligation to deliver it. This document in original also revealed that Al Fajer Properties didn`t intend to develop a Residential Building on Plot H3, nor a Residential Mixed use Building like quoted in their new draft contract on March 2008, the time frame in which the deal with Dynasty Zarooni was already arranged and new Brochures have been already in the printing for a sales promotion of the now 100 % Commercial Tower on Plot H3. This document uncovered why the couple should have been mislead and been left in the illusion of a now Mixed used Residential Tower, the reason of unwillingness of Al Fajer Properties to provide the missing declaration and documentation of the building constitution within the draft contract, to which they extorted the couple several times to sign in March 2008 . Upon today October 2011, Al Fajer Properties is still holding the since 2005 45% paid installments ( 345.000 AED) from the couple and is not showing any positive will to repay this amount nor remembering the once shown will of a compensation. The Tower however on Plot H3 Jumeirah Lake Towers , which was converted by Al Fajer in a Commercial Building in March 2008 ,renamed to Jumeirah Business Centre 8 , sold in March 2008 to Dynasty Zarooni, is not completed until today. From 2010 until 2011 Al Fajer Properties was several times contacted directly via email and an adress of a Lawyer who presented Maktoum Hasher. Within this correspondence it has been asked several times to pay the outstanding debts to the couple. Upon today Al Fajer Properties resists to do so. In a last correspondence hold with an other lawyer of Al Fajer Properties in 2010 it was quoted, that his client, Maktoum Hasher Maktoum cannot remember that the couple had ever claims against him and that he never offered to repay the investments for the purchased accommodation. His further provocation was : ” Can you please send a copy of whatever contract you believe exists between Al Fajer Properties and your clients” ” If you supply evidence to support their assertion losses attributable to Al Fajer, my client ( Maktoum Hasher) will then review it. The lawyer was after this correspondence informed that a criminal complaint ( by providing him a copy of the complaint) was already filed against his client and that it is extremely remarkable, due to the evident correspondence of March 2008 until October 2008 from other lawyers of Al Fajer, that his client Maktoum Hasher Maktoum start now in 2010 to simulate not to be in the acknowledge that there was still a claim against Al Fajer Properties and him and that he cannot remember his acts,when he threat them in March and October by saying just returning a refund of the paid installments to the couple. Sheikh Maktoum Hasher Juma Al Maktoum who comitted this fraud to the German couple didn`t pay back the money ( over 60 000 Euro) he hold in the accounts of Al Fajer Properties since 2007 nor did he pay the compensation upon today in 2011. Other Investors who bought offices from Al Fajer Properties development Jumeirah Business Centre ( Eboy Ivory Tower) after Al Fajer Properties deal with Dynasty Zarooni in March 2008 had also been in trouble with his His Highness Sheikh Maktoum Hasher Maktoum Juma Al Maktoum……..